Gullen Range Wind Farm and Gullen Solar Farm are excited to announce the launch of their Wind and Solar Farm Tours. The tours are a great opportunity for the community to visit Australia’s first co-located wind and solar farm, which is located along SERREE‘s (South East Region of Renewable Energy Excellence) Renewable Energy Trail. Come and see how a wind and solar farm works. Get up close to a wind turbine and a solar array. Find out more about renewable energy. The tour will be about 2.5 hours long and will comprise approximately 2 hours on the minibus tour itself and 30 minutes at the Crookwell Hotel Bistro, where you can enjoy light refreshments and a mini information display. Children are welcome on the tour, but they’ll need to be able to sit quietly on the bus for the length of the tour. Please consider this, especially if you are bringing very young children. If you require special assistance, please let us know on the booking form and we’ll see how we can help. You will need to be able to get on and off the minibus yourself, or have someone with you to assist. The tour will involve walking on short sections of uneven ground, however you can choose to stay on the bus if you prefer. As you will be visiting an operational wind and solar farm, we ask you to wear closed, sturdy shoes and appropriate clothing for all weather types (sunny, rainy and/or windy). Please note that there are no toilets on the minibus. However, there will be an opportunity to use toilet facilities at the wind farm and at the Crookwell Hotel. The Wind and Solar Farm tour will depart and return to the Crookwell Hotel in Crookwell, which is located approximately 45km from the Hume Highway at Goulburn. Please meet the tour guide inside the Crookwell Hotel Motel prior to the tour departing at 11.30am. The bus will not wait for you if you are late. Better to arrive early and have a coffee prior to departure. You can drive or catch a bus to Crookwell. 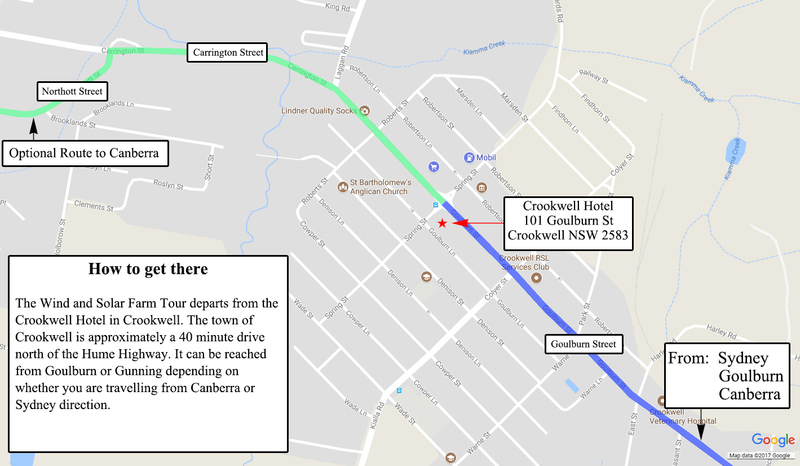 For more information about catching a bus from Goulburn to Crookwell, check out the bus link here. A map showing the location of the tour pick-up point can be downloaded here. Parking will be available on nearby streets. The tour minibus will depart from the Crookwell Hotel at 11.30am and return approximately 2-hours later to the same location. You are welcome to stay for complimentary light refreshments, ask questions and read our mini information display in the Hotel Bistro. Consider taking a look at historic Crookwell while you are in the area. Check out the ‘Visit Upper Lachlan’ website here for more information on attractions in Crookwell. Tickets for the next tour will open up one week after the current tour.